What is in your computer network? What devices are connected to it, and where are they located? – These questions sound not like curiosity when it comes to documenting a network of dozens or hundreds of computers, staggered with networked printers, routers and other network equipment, spread over numerous rooms on several floors or buildings. If running throughout the entire building to get the diagram of your network is not something you've been dreaming about, take a look at 10-Strike's Network Diagram and check out how to draw a diagram of your local area network with just a couple of mouse clicks and no client software to be installed to the remote computers in the network. 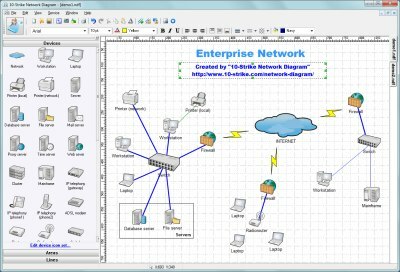 The simplicity of the diagrammer amazes in the view of its productivity – drawing a sophisticated network diagram takes as little as answering a few simple questions asked by the diagram creation wizard. Provide the IP range, select the polling methods, wait a moment while the application is gathering the requested data, and voila – all devices connected to your network are neatly laid before your eyes. With all that, the application demonstrates high performance no matter how large the network is – multiple scan threads allow polling a literally infinite number of connected devices within a specified IP range. Well, getting a list of networked devices is only a half of the job: we want our network map to be readable intuitively, at a glance. 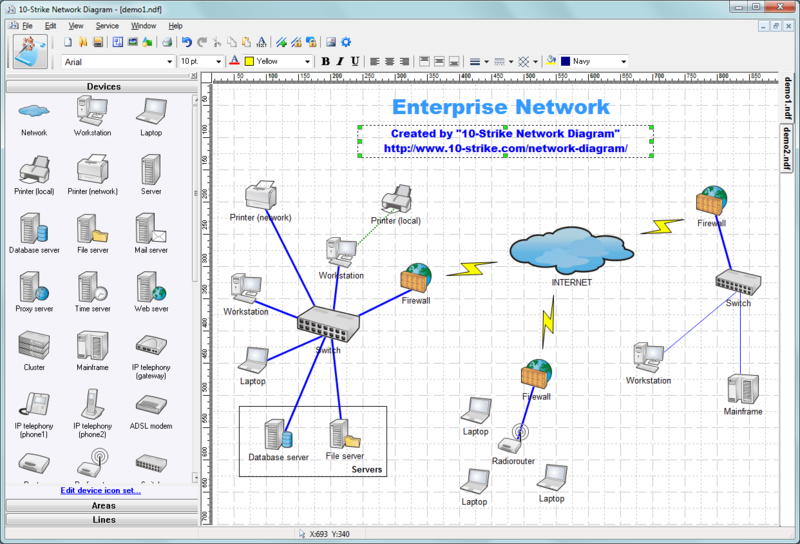 For that purpose, the Network Diagram application utilizes an intelligent hardware recognition algorithm and quickly – thanks to running multiple hardware detection methods simultaneously – recognizes networked and local printers, file and database servers, routers, switches, hubs, and other equipment and places them on the network map in the form of intuitively recognizable icons. Now just dropping an eye on the network diagram gives us a clear idea of the content of our network. To get more out of our network map, we may want to customize it and make it a bit more informative and prettier. Actually, we could have drawn the whole diagram from scratch by hand, and we wouldn't have to be artists to be able to manage that – the application has an internal Visio-like editor and comes packed with icons for all kinds of devices. Adding a device to the diagram is as easy as dropping its icon on the white space of the editor. We can also replace icons for devices found automatically – e.g., replace a regular router icon with a wireless one – to give the map a more realistic look. Actually, the network diagram can reflect your office map – link your networked devices with connection lines, arrange them by groups as they are physically arranged by the rooms of your office – simply drag the devices over the map; the connection lines will follow – visualize the areas by with the area background, and add the maximum of available information by placing labels to available devices, areas and even “wires”. What's next? – The network diagram can be copied to clipboard and pasted to other documents in an editable vector format. Network scanning results can be saved to a readable by Excel CSV file, network diagrams can be saved as Microsoft Visio documents, raster and vector images, the entire network map document can be printed on a printer with options for setting position on page, labels and captions, print quality, etc. 10-Stike Network Diagram is a truly quick and painless solution for documenting local area networks.